At The Lighthouse School, we develop the joy of music by doing: We sing, we play instruments, we move. Using poems, rhymes, games, songs, and dances, we learn to speak, sing and play together. We then learn to notate familiar rhythms and melodies. 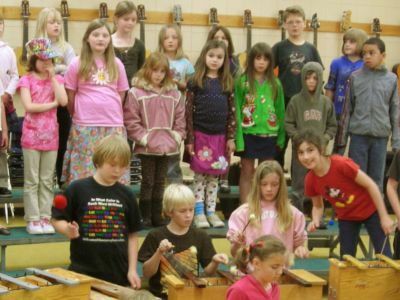 Following the philosophy of Carl Orff, we hope to grow enthusiastic players, singers and dancers. In our music classroom, we are fortunate to have a wealth of instruments available to our students. Primary grades begin with small percussion instruments, rhythm sticks, maracas and tambourines... By third grade, recorder class begins. 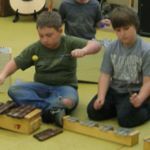 Older elementary students play mallet instruments in the Orff Orchestra (a variety of xylophones and glockenspiels). In sixth grade, guest artists teach African drumming and dancing. All students will also learn basic drum circle, autoharp, and guitar skills. We focus on working together "con una voz" ...with one voice, and we learn to support each other both as soloists and as respectful listeners. In middle school (grades 6-8) we form The Lighthouse Middle School Choir and attend Choir Festival with other schools from our district. Participation in music has been shown to improve connections between the right and left sides of the brain; to improve memory and attention; to improve brain response to auditory stimulus, and to involve all learning styles simultaneously; kinesthetic, auditory and visual. As we immerse ourselves in music, we strengthen connections with each other, with family, school, community, and with the world.